Pounce! Taffy attacks her toy mouse, scampers around with it, and then retreats to her basket. Moments later, she jumps out and races over to the floor-length curtains and burrows in under them. The only quiet moment with Taffy in the house is when she is sleeping. Taffy is a 3-month-old ball of fun. A few months ago, Taffy was a stray, with no toys or attention. Life on the street was perilous for one so small. Fortunately, she ended up at Contra Costa Animal Services in Martinez, CA, and her description and photo were posted on Petfinder. Meanwhile, Laura Noelle and her husband, who live in Rodeo, CA, had decided to adopt a cat. They scrolled through Petfinder, looking for the perfect match, and then decided to go meet some of the listed pets. “When we got to the shelter, we looked at many cats, ranging from itty-bitty kittens to adults,” Laura says. “Some were meowing away and some were very quiet.” How does an adopter decide? Sometimes a pet takes matters into her own paws. “When we passed by Taffy’s kennel, she came right to the door and put her paws up, watching us intently,” Laura says. That was enough for them. They adopted her. 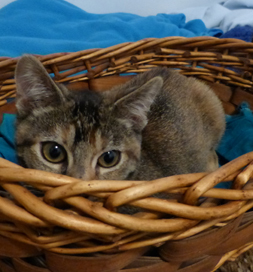 At first she was timid, but it didn’t take her long to learn what’s fun about a home – like toy mice and baskets and curtains. We get it. It’s warm and fuzzy to have a home where people love you.